If there’s something that gives a sharp edge to the Moto Z series, it is its modular design that supports different Moto Mod accessories. 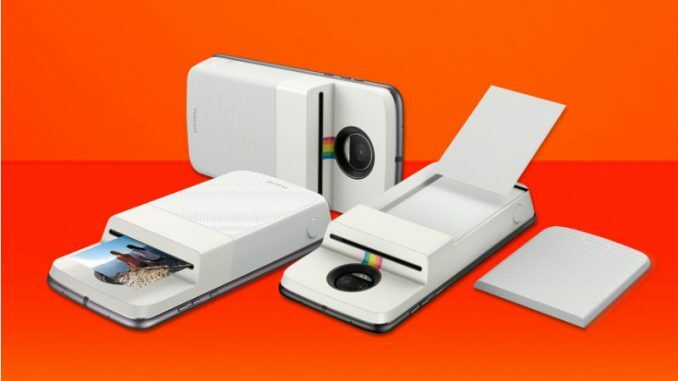 And now, Lenovo’s Moto brand has partnered with Polaroid to expand the existing concept by adding a photo printer module called the Insta-Share Printer Mod. The new Moto Mod will be available for purchase through Verizon later this week with a price tag of $199.99 (approximately Rs. 13,000) and will hit global markets in the coming months. Polaroid’s Insta-Share Printer Mod lets you capture your memories through your Moto Z smartphone and then print them live, without relying on third-party hardware. The Mod can also print your images directly from Facebook, Instagram and Google Photos. Moreover, it is capable of printing 2×3-inch smudge-proof photos with customisable filters, boarders, and text. You need to snap the Insta-Share Printer Mod to your Moto Z and then click the physical button to launch the camera. Once you’ve locked your subjects or objects in the frame, the module is ready to take their prints. “Your Moto z already captures all your favourite moments, and now you can treasure them with the latest innovation in instant printing. The Polaroid Insta-Share Printer brings your photos to life in seconds, letting you enjoy photos beyond your smartphone screen,” Moto said in a blog post.